One of the Greatest Pageants of the Year in Arizona! If you are a first time attendee, you will want to choose a day that features the horses and riders in full Arabian Costume. 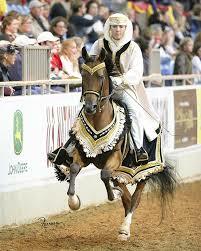 The pageantry is truly magical, transporting both rider and observer to another world. The facility accommodates multiple competitions at the same time, with grandstand seating. There is a spacious sales pavilion featuring horse and rider themed clothing and a wide array of horse-themed jewelry and casual clothing featuring a lot of “bling.” There many options for food and drink, as you are not permitted to bring your own libations into the property. The other “must see” adventure available to visitors are the behind the scenes Barn tours. Owners and trainers open their facilities to the awe of the visiting public, educating about the intricacies of the Arabian breed and the process of training, grooming and nurturing championship contenders. The Arabian Horse Association of Arizona’s website has the full range of scheduled events, and you can purchase your tickets in advance. Also listed are the times for the Barn tours—space is limited for these popular tours, and prior reservation is required. This entry was posted in Area Events, Arts, Culture, Schools & Clubs and tagged Scottsdale Arabian Horse Show. Bookmark the permalink.